Images related to postprimary tuberculosis are provided below. 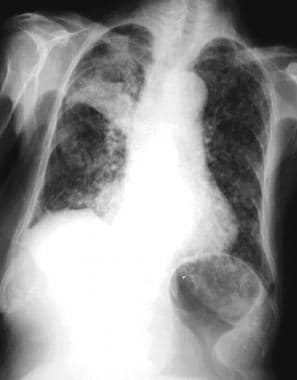 Posteroanterior chest radiograph from a 65-year-old man with a long history of smoking, chronic obstructive pulmonary disease (COPD), and childhood tuberculosis. The patient presented with a history of recent onset of coughing, as well as had a fever and night sweats. This image shows right-upper lung (RUL) bullous disease and suggests a left-lower lung (LLL) cavity. The LLL abnormality was new, appearing since his previous examination a year earlier, which was performed before the onset of his recent symptoms. 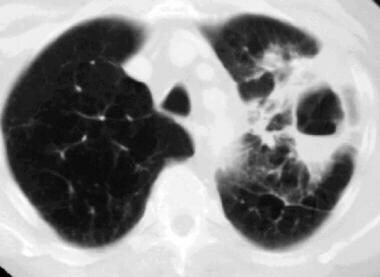 Computed tomography scan, pulmonary window setting, in a 65-year-old man with a long history of smoking, chronic obstructive pulmonary disease (COPD), and childhood tuberculosis. This image shows a thick-walled, left-lower lung (LLL) cavity with an air-fluid level; a smaller, more medial cavity; and some lung parenchymal opacities. Acid-fast organisms were detected in the patient's sputum, and the culture results indicated the presence of Mycobacterium tuberculosis. 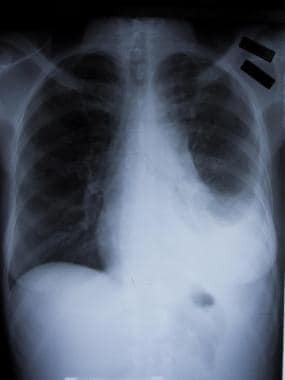 Posteroanterior chest radiograph in an 83-year-old woman who was sent to the emergency department from her nursing home because of a recent history of productive cough, weight loss, and fatigue. Until recently, the woman was the social director at the nursing home. In her younger years, the patient had tuberculosis during her first pregnancy; this illness occurred before antibiotic therapy was used to treat tuberculosis. This image demonstrates extensive bilateral lung nodules and a cavity in a partially collapsed right upper lung. Sputum cultures were positive for tuberculosis. The nodules indicate endobronchial spread of the tuberculosis. Selective bronchial arteriogram in a patient with history of tuberculosis who presented with massive hemoptysis. 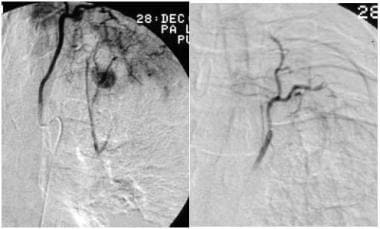 This image reveals a Rasmussen aneurysm (left) that was embolized (right). Posteroanterior chest radiograph from a young female patient who presented with a cough, positive findings on skin testing with purified protein derivative of tuberculin (PPD), and a pleural effusion that was positive for acid-fast bacilli. This image shows a left pleural effusion and left lower-lobe consolidation. 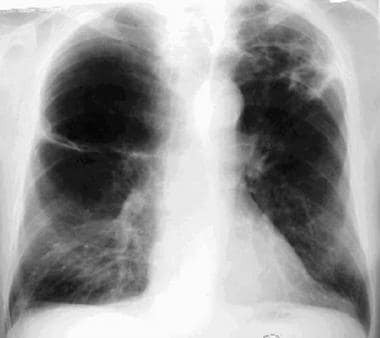 Although the findings of currently active TB can often be differentiated from previous scarring on radiologic images, the possibility of latent or temporarily quiescent infection exists, and healed or inactive TB should not be diagnosed without adequate clinical information and/or the finding of calcified lesions. Radiographic follow-up is recommended in all cases of TB because it provides valuable information regarding the extent of the disease and its progression. For excellent patient education resources, visit eMedicineHealth's Infections Center. Also, see eMedicineHealth's patient education article Tuberculosis. Cavitation is a distinguishing feature of postprimary TB; this finding is seen on chest radiographs in about half of the cases and is discernible on chest CT scans in most cases. Typical cavities are thick walled and irregular. Air-fluid levels are uncommon and usually indicate superinfection; however, in 9% of cases, air-fluid levels can be seen in other circumstances. The persistence of cavitation without healing is unusual and should be investigated to exclude mycetomas, particularly in patients with persisting hemoptysis. Cavitation can lead to endobronchial spread to the remaining lung or rupture into the pleural space, where it can cause an empyema or bronchopleural fistula. Cavitation can also cause pseudoaneurysms of the pulmonary artery, which are called Rasmussen aneurysms. See the image below. Miliary spread is less common in postprimary TB and is caused by erosion of bronchial vessels or pulmonary veins. See the image below. 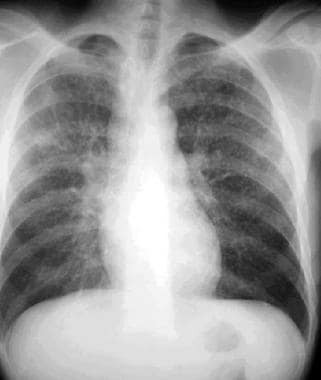 Posteroanterior chest radiograph in a 31-year-old man with acquired immunodeficiency syndrome (AIDS) and a previous history of Pneumocystis carinii pneumonia (PCP). The patient developed shortness of breath, high-grade fever, and generalized lymphadenopathy. This image shows right mediastinal adenopathy and bilateral, uniformly tiny nodules. The man underwent biopsy by means of video-assisted thoracic surgery (VATS), with the resultant diagnosis of miliary tuberculosis. Most cases of TB in patients with human immunodeficiency virus (HIV) infection or other immunosuppressive diseases are secondary to reactivation of a latent infection. However, a hypersensitive response or the absence of adequate immunity results in disease that behaves like primary TB. Miliary spread with systemic dissemination is more common in these immunocompromised individuals than in the healthy population. In these patients, radiographic findings are atypical, and the images often show diffuse dissemination, with striking lymphadenopathy and/or pleural effusions. Parenchymal involvement can range from consolidation to the absence of any lung opacities. Pleural effusion and parenchymal involvement are seen in the image below. In the developed world, cavitation is uncommon in HIV-infected patients who have TB. In endemic areas, a more typical response, including upper-lobe disease and cavitation, is frequently seen in affected patients. This variance may be related to differences in the immune status of the patients. TB and lung cancer coexist in as many as 5% of cases, but whether TB independently increases the likelihood of cancer remains unclear. TB cannot be confidently diagnosed on the basis of chest radiographic findings alone because the imaging results can often be normal in primary TB. Normal findings are unusual in postprimary lung disease, but they cannot be used to exclude extrapulmonary TB. However, the combined positive predictive value is high for the typical symptoms of the disease and the finding of cavitary upper-lobe infiltrates on chest radiographs. Sarcoidosis, granulomatous fungal infections, Nocardia infections, and atypical mycobacterioses are the conditions that most commonly mimic pulmonary TB. Computed tomography scan, pulmonary window setting, in a patient with treated postprimary cavitary tuberculosis who had persistent hemoptysis. This scan shows a right-upper lung cavity with a dependent mass within the cavity and air around it. This is the so-called crescent sign, which is a characteristic finding for a mycetoma, usually an aspergilloma. 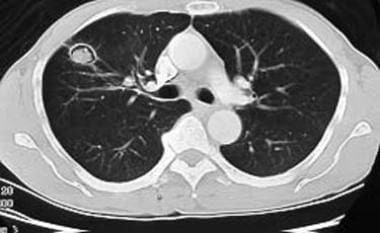 Computed tomography scan, pulmonary window, from a patient with postprimary tuberculosis. This image shows a miliary tuberculous pattern. Used with permission (Amorosa, 1999). A tree-in-bud pattern of 5- to 10-mm centrilobular nodules has been associated with endobronchial spread on HRCT scans, which helps in identifying active disease. Also, postprimary TB disease in immunocompromised patients may not be seen on chest radiographs. 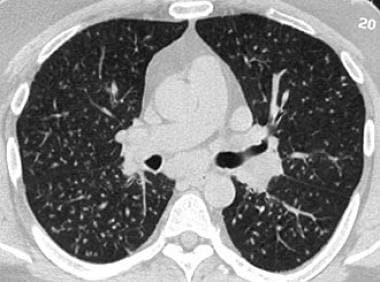 Mediastinal adenopathy, subtle pleural changes, and miliary lung parenchymal involvement are best detected with CT scanning. Although no single radiologic feature is diagnostic of postprimary TB, a combination of upper-lobe opacities with a dominant cavitary process increases confidence in the diagnosis of TB. A tree-in-bud pattern is associated with endobronchial spread and suggests active disease. Regarding false-positive findings, nontuberculous mycobacterial (NTM) infections can mimic all radiologic findings that are associated with postprimary TB. Typically, these findings are seen in elderly men with chronic obstructive pulmonary disease (COPD); in such patients, NTM infections should always be considered. Fungal infections, particularly histoplasmosis, may also result in similar findings. Cavitary lung disease that resembles TB has also been reported in cases of pyogenic infections, sarcoidosis, vasculitis, parasitic infections, bronchiolitis obliterans and organizing pneumonia (BOOP), and malignancies. Regarding false-negative findings, postprimary TB resembles primary TB in immunocompromised patients, and it can be radiologically misclassified. CT and/or HRCT scan results are unlikely to be completely normal in postprimary TB. Positron emission tomography (PET) scans may be positive in cases of active tuberculosis. Positive results are usually found when malignancy is suspected during the workup of a lung abnormality. Current nuclear medicine tests are not specific for tuberculosis. There is increasing research on tagging nuclear medicine labels to molecular ligands for Mtb. While such molecular imaging is likely to be useful, it is yet to reach clinical practice. In one small study,  Technetium Tc-99m ciprofloxacin single-photon emission computed tomography (SPECT) was found to have 89% positive predictive value and 83% negative predictive value for the diagnosis of active pulmonary tuberculosis. This approach is particularly promising in differentiating active tuberculosis from prior scarring. Cegielski JP, Chin DP, Espinal MA, et al. The global tuberculosis situation. Progress and problems in the 20th century, prospects for the 21st century. Infect Dis Clin North Am. 2002 Mar. 16(1):1-58. [Medline]. Rubin SA. Tuberculosis. Captain of all these men of death. Radiol Clin North Am. 1995 Jul. 33(4):619-39. [Medline]. Hopewell PC. A clinical view of tuberculosis. Radiol Clin North Am. 1995 Jul. 33(4):641-53. [Medline]. Ellis SM. The spectrum of tuberculosis and non-tuberculous mycobacterial infection. Eur Radiol. 2004 Mar. 14 (suppl 3):E34-42. [Medline]. [Full Text]. Fujita J, Higa F, Tateyama M. Radiological findings of mycobacterial diseases. J Infect Chemother. 2007 Feb. 13(1):8-17. [Medline]. Griffith-Richards SB, Goussard P, Andronikou S, et al. Cavitating pulmonary tuberculosis in children: correlating radiology with pathogenesis. Pediatr Radiol. 2007 Aug. 37(8):798-804. [Medline]. McAdams HP, Erasmus J, Winter JA. Radiologic manifestations of pulmonary tuberculosis. Radiol Clin North Am. 1995 Jul. 33(4):655-78. [Medline]. Dunlap NE, Bass J, Fujiwara P, et al. Diagnostic standards and classification of tuberculosis in adults and children. Ad-hoc committee of the Scientific Assembly on Microbiology, Tuberculosis, and Pulmonary Infections. Am J Respir Crit Care Med. 2000 Apr. 161 (4 pt 1):1376-95. [Medline]. [Full Text]. American Thoracic Society, Centers for Disease Control and Prevention, Infectious Diseases Society of America. Controlling tuberculosis in the United States. Am J Respir Crit Care Med. 2005 Nov 1. 172(9):1169-227. [Medline]. [Full Text]. Barnes PF, Lakey DL, Burman WJ. Tuberculosis in patients with HIV infection. Infect Dis Clin North Am. 2002 Mar. 16(1):107-26. [Medline]. Washington L, Miller WT Jr. Mycobacterial infection in immunocompromised patients. J Thorac Imaging. 1998 Oct. 13(4):271-81. [Medline]. Hunter RL, Actor JK, Hwang SA, Karev V, Jagannath C. Pathogenesis of post primary tuberculosis: immunity and hypersensitivity in the development of cavities. Ann Clin Lab Sci. 2014 Fall. 44 (4):365-87. [Medline]. Pitman AG, Hicks RJ, Binns DS, et al. Performance of sodium iodide based (18)F-fluorodeoxyglucose positron emission tomography in the characterization of indeterminate pulmonary nodules or masses. Br J Radiol. 2002 Feb. 75(890):114-21. [Medline]. [Full Text]. Skoura E, Zumla A, Bomanji J. Imaging in tuberculosis. Int J Infect Dis. 2015 Mar. 32:87-93. [Medline]. Bolursaz MR, Mehrian P, Aghahosseini F, Lotfian F, Khalilzadeh S, Baghaie N, et al. Evaluation of the relationship between smear positivity and high-resolution CT findings in children with pulmonary tuberculosis. Pol J Radiol. 2014. 79:120-5. [Medline]. Washington L, Palacio D. Imaging of bacterial pulmonary infection in the immunocompetent patient. Semin Roentgenol. 2007 Apr. 42(2):122-45. [Medline]. Stout JE, Kosinski AS, Hamilton CD, Goodman PC, Mosher A, Menzies D, et al. Effect of improving the quality of radiographic interpretation on the ability to predict pulmonary tuberculosis relapse. Acad Radiol. 2010 Feb. 17(2):157-62. [Medline]. Sant'Anna C, March MF, Barreto M, Pereira S, Schmidt C. Pulmonary tuberculosis in adolescents: radiographic features. Int J Tuberc Lung Dis. 2009 Dec. 13(12):1566-8. [Medline]. Nakanishi M, Demura Y, Ameshima S, Kosaka N, Chiba Y, Nishikawa S, et al. Utility of high-resolution computed tomography for predicting risk of sputum smear-negative pulmonary tuberculosis. Eur J Radiol. 2010 Mar. 73(3):545-50. [Medline]. Kim WS, Choi JI, Cheon JE, et al. Pulmonary tuberculosis in infants: radiographic and CT findings. AJR Am J Roentgenol. 2006 Oct. 187(4):1024-33. [Medline]. Amorosa JK. Essentials of Radiology [CD-ROM]. Moraga, Calif: Medical Interactive; 1999. Goo JM, Im JG. CT of tuberculosis and nontuberculous mycobacterial infections. Radiol Clin North Am. 2002 Jan. 40(1):73-87, viii. [Medline]. Poey C, Verhaegen F, Giron J, et al. High resolution chest CT in tuberculosis: evolutive patterns and signs of activity. J Comput Assist Tomogr. 1997 Jul-Aug. 21(4):601-7. [Medline]. Lee M, Yoon M, Hwang KY, Choe W. Tc-99m ciprofloxacin SPECT of pulmonary tuberculosis. Nucl Med Molecular Imag. June 2010. 44:116-22.